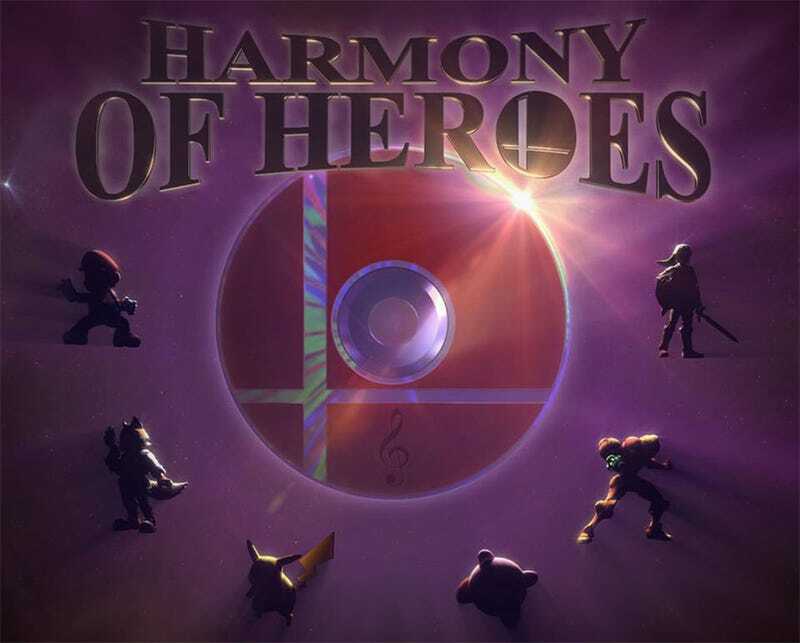 Were it possible, I'd replace every piece of music in my copy of Smash Bros. 3DS with one of the 101 tracks in Shinesparkers' "Harmony of Heroes", an amazing 101 track Super Smash Bros. fan arrangement album, now available for free download. Some 60 or so artists contributed to this massive undertaking, announced last year and launched yesterday with a livestreamed listening party. Music from all corners of the Smash Bros. universe is represented, interpreted in so many different genres, from classical to electronic to jazz to calypso. I was hooked from the first track, "Challenger Approaches", a dramatic and powerful theme, complete with operatic vocals. I'm also particularly fond of the rockin' rendition of the Dr. Mario theme performed by Kirby's Dream Band. I wish it were my theme song. The full album was launched on the Harmony of Heroes website last night, tearing through the site's bandwidth and rendering it inoperable. While that situation is worked out, the full album is available as a Torrent file in two different flavors — zipped MP3s and a massive 6gb lossless RAR. Don't forget to seed!